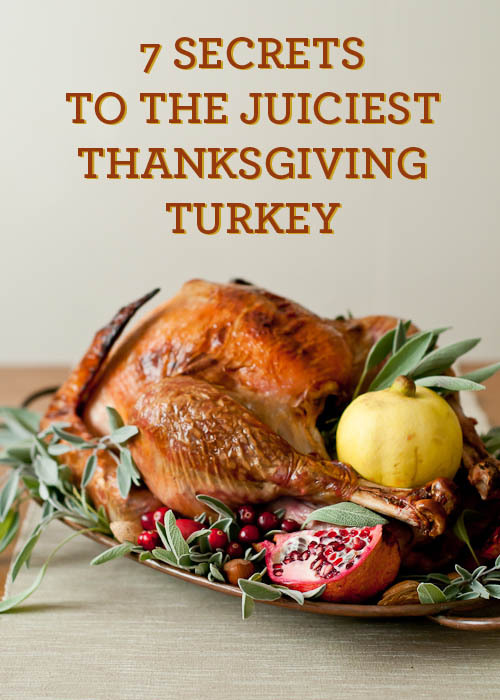 Follow these tips for your own juicy Thanksgiving turkey and you’ll be saying the same thing! 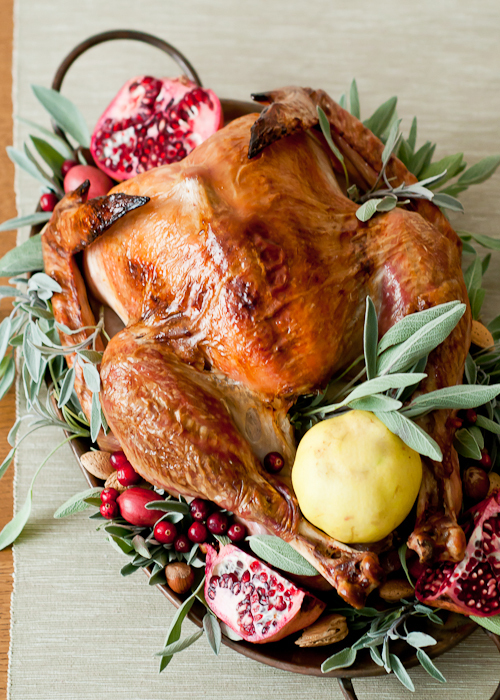 Plus, you and your guests will be enjoying the juiciest Thanksgiving turkey ever. 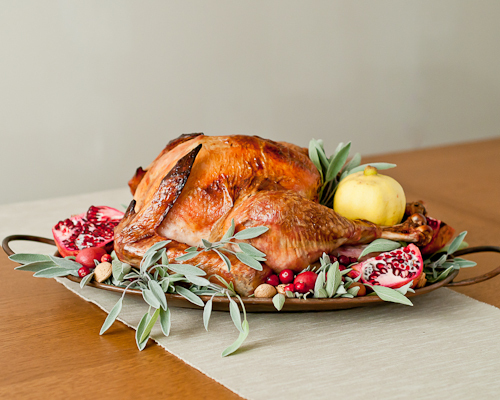 Before we start, there are several different kinds of turkeys available — self-basting, kosher, and natural. You’ll find these fresh or frozen. (Note: some turkeys are partially frozen and still labeled “fresh.”) In this tutorial, I’m using a fresh, all-natural, free range turkey. While I don’t mind using the turkeys treated with salt solutions, I do prefer seasoning them myself for greater control. But that is just a preference. The first step is to thaw your turkey. If you have a fresh turkey, you can skip this step. 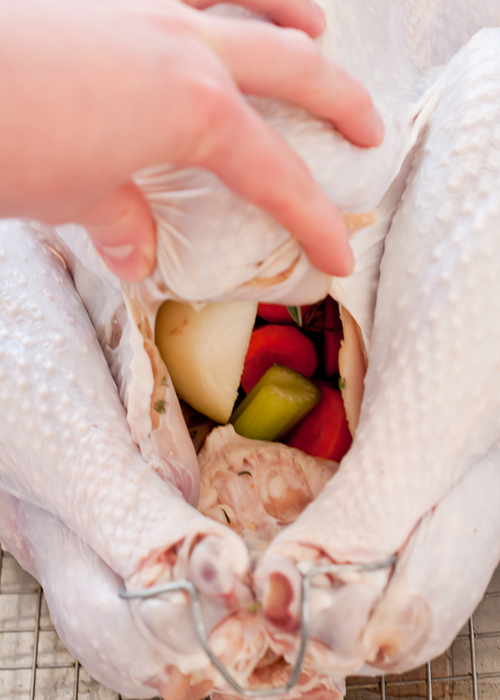 Make sure to thaw your turkey at the proper temperature to avoid bacteria growth. Thawing can be done in the refrigerator or in cold water, which takes about 3/4 the time. Be sure to thaw the turkey over a rimmed baking dish so the juices don’t run all over and contaminate other foods and surfaces. 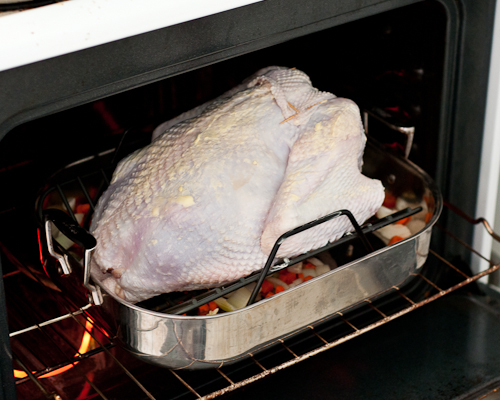 Secret #1: If you’ve never cooked a turkey before, you may be shocked to find out how long it takes to thaw a turkey. Use this handy reference and plan ahead! Once the turkey has been thawed, remove the giblets — if you like, you can save them to make homemade turkey stock. (In fact, I recommend thawing the turkey a day or two before you roast it and make the stock so it’s ready to go for gravy.) 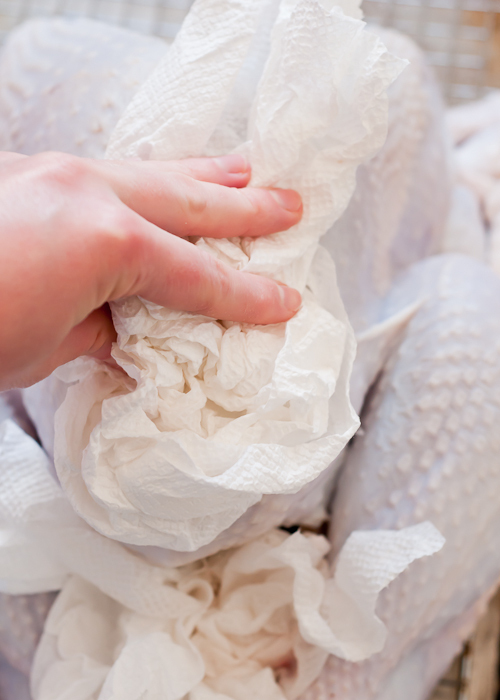 Rinse the turkey inside and out in cool water and pat dry with paper towels. 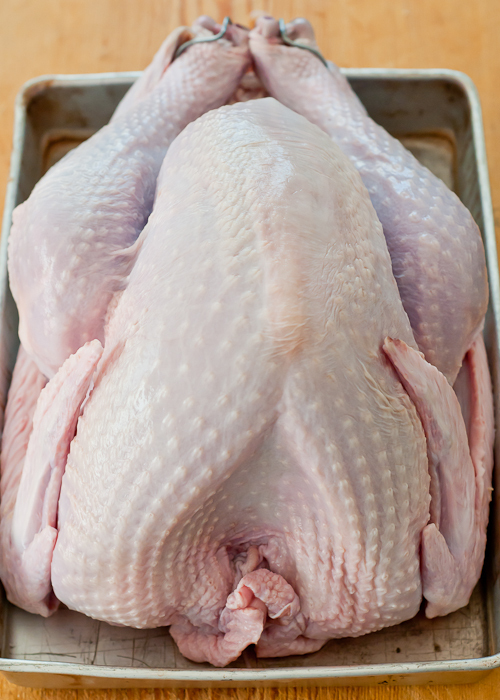 When I buy a fresh, natural turkey, like the one pictured, I like to brine it to help make it as juicy as possible. 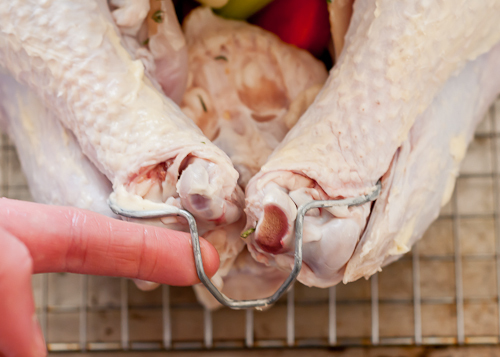 If your turkey has been pre-salted (check the label), go ahead and skip this part. Think of brining like marinating. It helps season and draw moisture into the meat to keep it flavorful and juicy. A good rule of thumb is to use 1 cup of table salt (2 cups kosher salt) and 1/2 cup sugar (white or brown) for every gallon of water. Brining recipes vary greatly on how long the turkey should brine. I allow plenty of time, at least 8-12 hours. 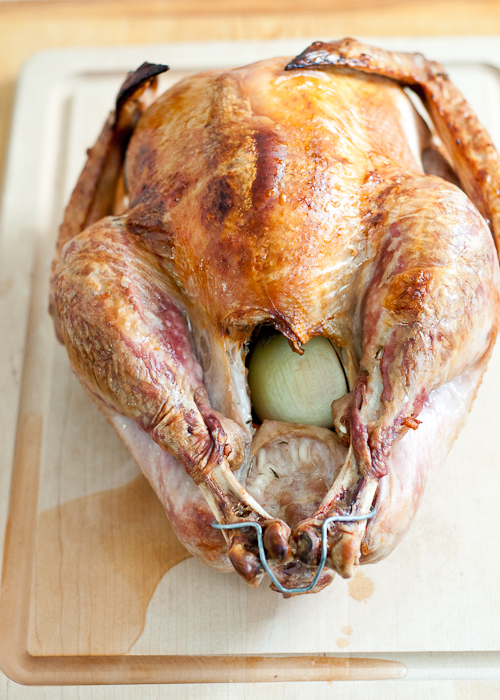 Secret #2: Brining means you can skip the basting later on. Dissolve the salt and sugar in the water and add any seasonings you want to use. I like to use a combination of herbs and spices — rosemary, thyme, bay leaves, peppercorns, whole cloves and allspice, plus I put in some leek tops and halved garlic cloves for extra flavor. 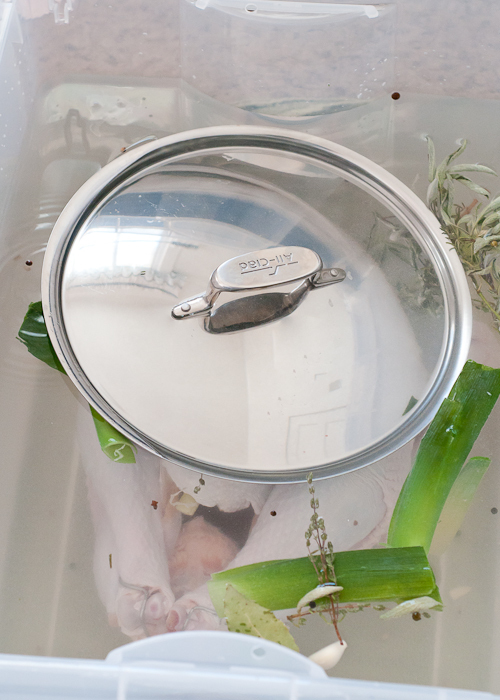 Place the turkey and the brining solution into a sterilized plastic or non-reactive metal container. You can also use brining bags and place it in a plastic tub in case it leaks. 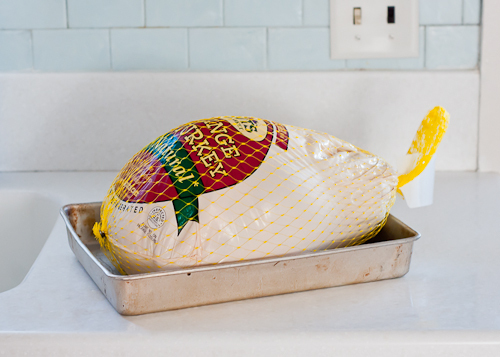 You want to keep the turkey at 40 degrees F, so you’ll either want to refrigerate the turkey in the brine, or leave it someplace cool and add ice or gel ice packs. 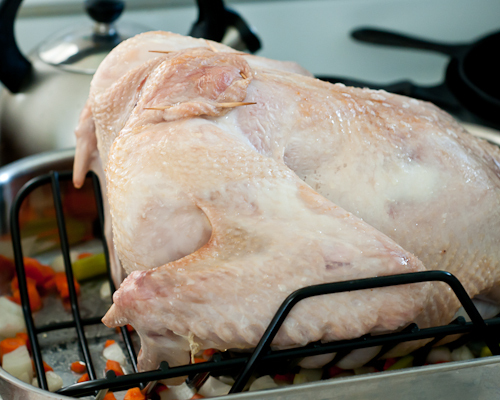 If it’s cold enough outside, you can even put the turkey in a safe place and let it brine there. I had a tough time finding a container that was tall enough, so I ended up using a much larger plastic tub than I wanted. If you have the same problem, just be sure to follow the ratio of salt and sugar to water and you’ll be fine. 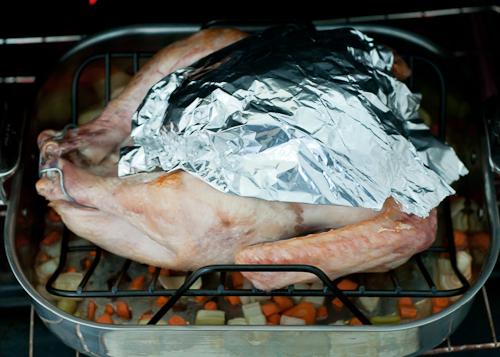 Secret #3: To keep the turkey totally submerged, top it with a heavy metal lid or plate. 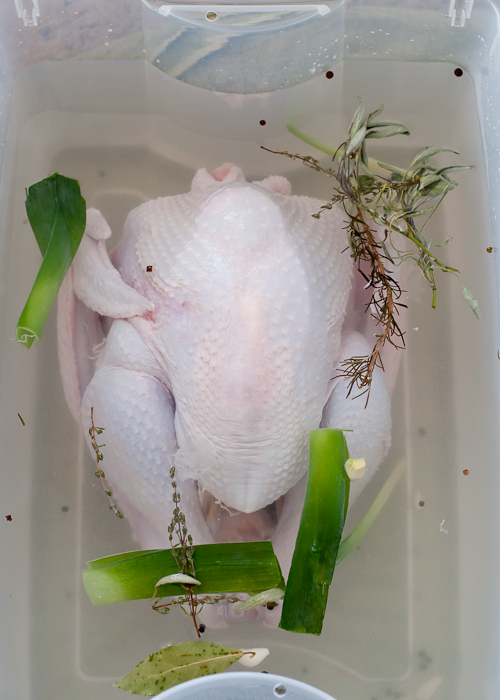 One the turkey has brined long enough, remove it from the brine and rinse it well with cold water. Discard the brine. Let the turkey continue to air dry (you can do this overnight in the fridge too) and allow it to come to room temperature for a few hours before you roast it. Preheat the oven to the temperature in your recipe. I prefer to start out with very high heat, such as 450 degrees for a half hour, then lower the heat to 350 degrees for the remaining time. 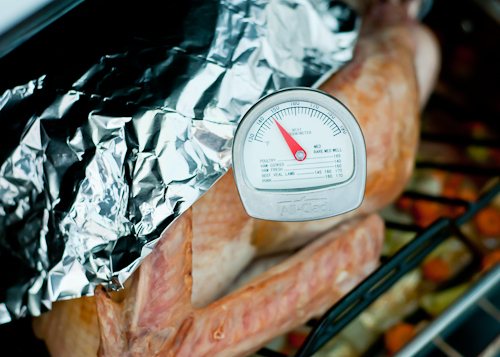 If your turkey comes with a plastic pop-up timer/thermometer, you should leave it where it is, but ignore it! 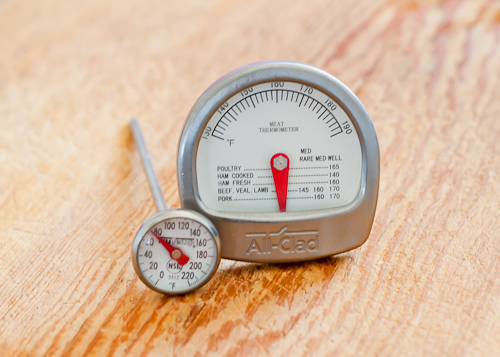 If you gauge done-ness by the pop-up timer, the white meat will be bone-dry and overcooked. Instead, use an instant-read thermometer. If you have a fancy digital one, even better. 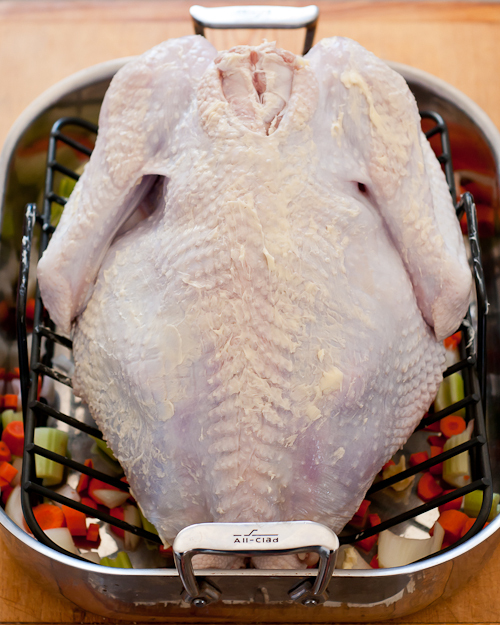 Just insert it into the thickest part of the breast and set the temperature for between 161-165 degrees F.
A roasting pan is one of the most important tools for the perfect turkey. 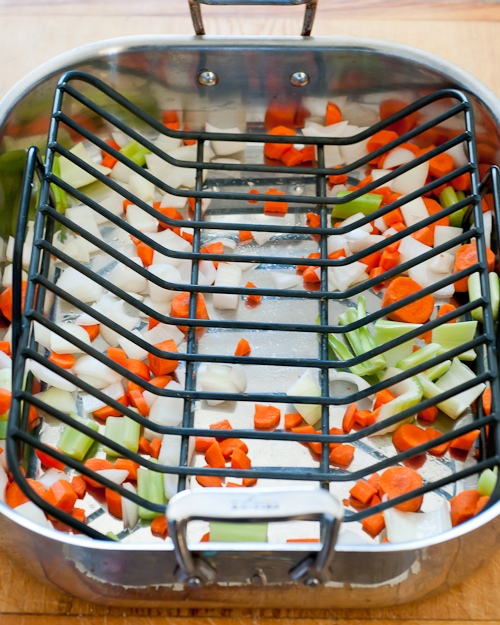 You can certainly get away with using a disposable aluminum pan if you are on a tight budget or don’t have storage space to accommodate a large pan. However, I recommend using either the roasting/broiling pan that comes standard with most ovens, or investing in a good-quality roasting pan that comes with a flat or V-rack. If you don’t have a rack, you can make your own using aluminum foil. I also like to dice carrots, onions, and celery to put on the bottom of the pan for extra flavor, but that is totally optional. 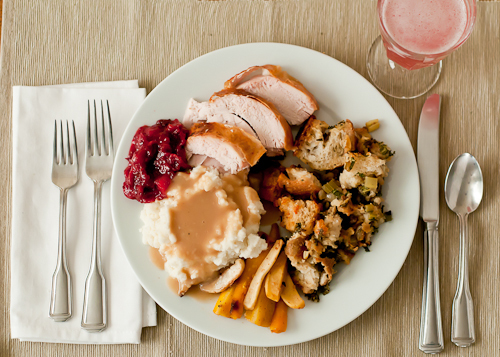 Secret #4: I never cook the stuffing inside the turkey. I prefer to bake it separately in another dish. 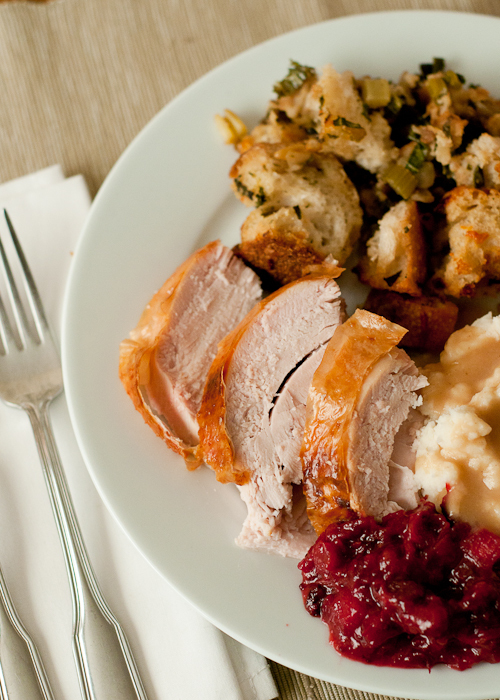 A turkey with stuffing takes longer to cook and can be a huge pain. 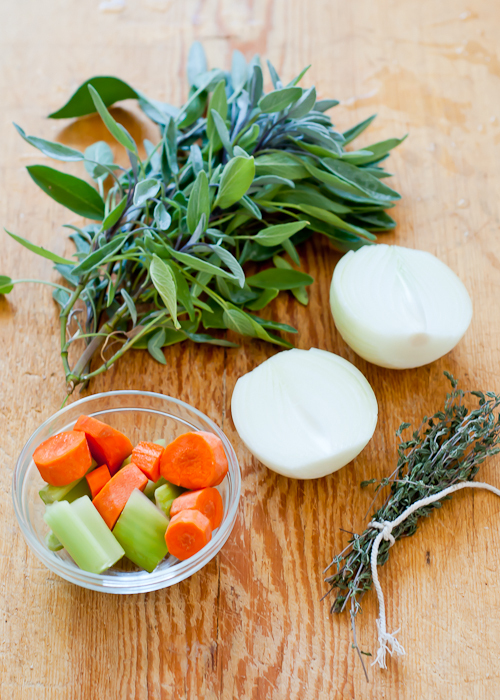 While I prefer not to stuff the turkey, I do like to place some aromatics inside the cavity — carrots, onions, garlic, celery, and fresh herbs are great. I’ve also used apples and lemons before as well. Before placing the turkey on the roasting rack, rub the skin liberally with butter or canola oil. And if you didn’t brine it, sprinkle the whole bird inside and out with salt and pepper, or a spice rub. The butter will help give you crispy, golden brown skin. I also like to truss the legs together if the turkey doesn’t come with it already done for me. But don’t stress! Most turkeys come with a plastic or wire trussing. So you can just leave it be. If your turkey has a big flap of neck skin, you can secure it using toothpicks or just tuck it in. 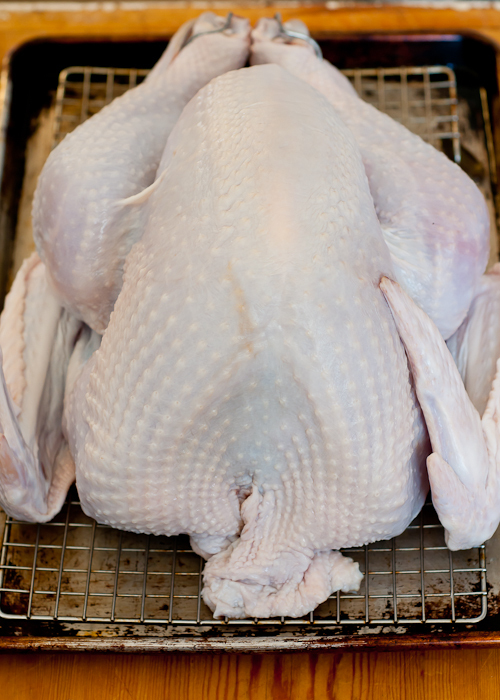 Secret #5: If you are using a v-rack, be sure to tuck the wings back underneath the turkey so they don’t flap around. You might notice that the turkey is breast-side down in the roasting pan. That’s on purpose! I like to start roasting that way and rotate the turkey periodically so the breast doesn’t get overcooked. 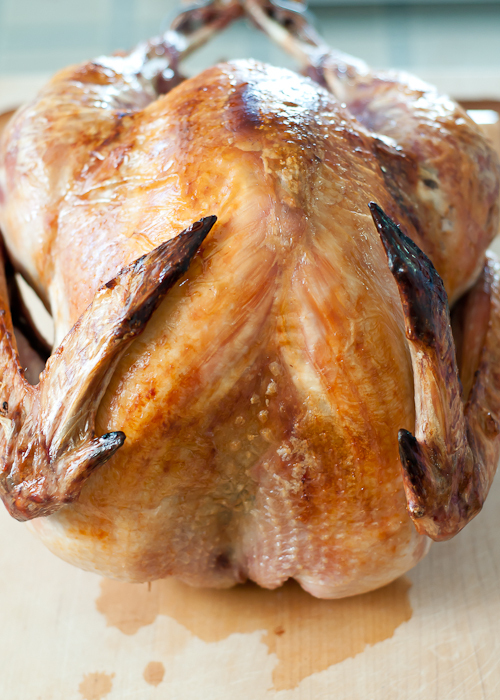 Secret #6: Finishing with the breast side up will also give you that crispy, brown skin everyone loves to fight over. Then it’s time to place it in the oven! A lot of people baste their turkeys continually throughout the roasting process. If you rub butter over the skin, that will be a good start and you can baste it a few times if you want to. If I brine my turkey, I don’t usually baste it. Otherwise, I baste mine when I turn it over. 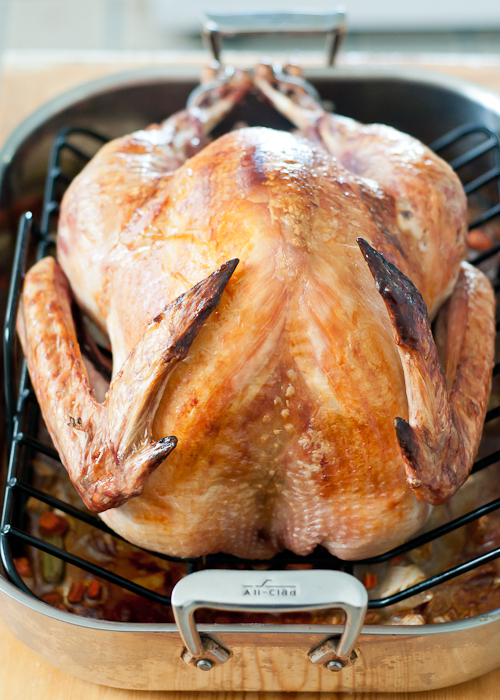 Secret #7: Don’t baste the turkey during the last hour or the skin could turn out flabby instead of golden and crispy. It’s a good idea to pull the pan completely out of the oven to turn the turkey over. That way the precious heat you’ve built up won’t escape and it will be much easier to maneuver while you turn it over. I use either clean oven mitts or wads of paper towels to protect my hands when I turn the turkey over. If you want, you can also partially turn the turkey over, allowing each leg to brown nicely (about 15 minutes per leg) before finishing with the breast-side up. Before sliding the turkey back into the oven, I make a foil diamond or triangle and fit it down against the turkey breast, leaving the legs uncovered because they can tolerate more heat. A lot of people rely on the leg wiggling easily to tell them when the turkey is finished cooking. I still like to rely on my thermometer. I like to take a reading in both the breast and thigh. The breast should be at 160-165 degrees F. and the thigh should be at least 170-175 degrees F, some say little as 165 degrees, but I let it get a little higher just to be safe. If it’s not up to the proper temperature, put it back in the oven for 15-30 minutes more and take another reading. See? Nice and brown. Just like you want. When the turkey is finished cooking, you need to let it rest for 30 minutes before slicing it. This can be done on a cutting board with a well around it to catch any escaping juices, or on a serving platter. This resting step is super important. During the cooking process, a lot of liquid is released. Not all of that will drip down into the roasting pan. A lot of it is sitting just under the skin. Letting the turkey rest for a bit will allow those juices to be reabsorbed and you guessed it, the turkey will be juicier. 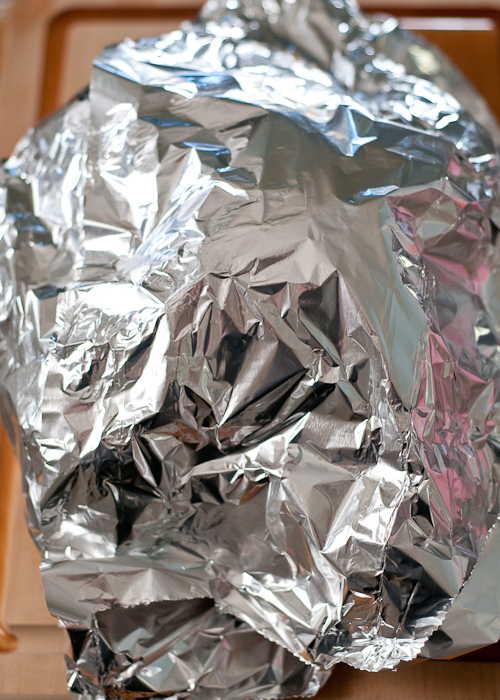 While the turkey rests, be sure to tent it with foil or a large metal bowl to retain the heat. Uncover the turkey, place it on the platter (and garnish if you like! ), and take it to the table to show off. Then give yourself a pat on the back, sit back and enjoy the compliments you’ll get on the juiciest turkey ever. P.S. — Ready for more? This is a great resource for learning how to properly carve a turkey. Also, you can find all the Secrets to Living Well posts here. i brine my turkey in a bag and place it in one of the produce bins inside the fridge. perfect size and easy to handle. Me too! I use the turkey oven roasting bags. If you get most of the air out of it the liquid will cover the turkey nicely. Just put it in breast down so the meatier part is completely submerged. No giant container needed! I’m not a big cook, but I wanted to tell you how much I enjoyed your photos, especially the first few of the cooked bird on the platter. Beautiful! Almost makes me want to try cooking a turkey myself. Ditto to R. Pyper’s comment. If that turkey is even half as good as you’ve made it look, then I’ll be eating several plates full, thank you very much! 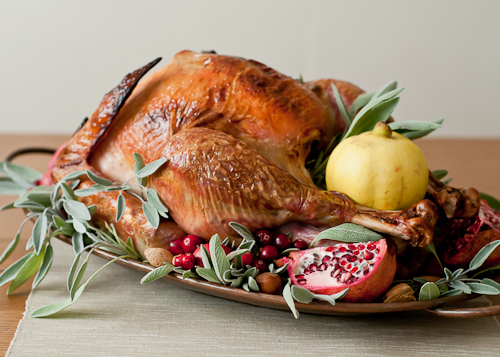 Gorgeous photos, gorgeous turkey-styling! I needed this! It will be my first Thanksgiving as a married woman, and my first time doing a turkey. Thank you, thank you, thank you! It’s a bit daunting but I may do it! It would be my first turkey ever! Your pictures are mouth-watering! The only time, prior to this coming year, that I cooked a turkey, I bought a prepared, pop in the oven turkey from Balducci’s. It ended up being a crazy Thanksgiving (hospital pick up due to a car accident involving a family member) and I had to keep calling our house giving my brother-in-law instructions to baste, etc. This year, we are hosting again and I am buying a frozen turkey, brining it and my parents sent us a gas grill so that we can grill it because my father loves it that way. I’m crossing my fingers! I brined mine in one of those huge ziplock bags….you know? the one for soccer balls and tennis rackets? & 5 Gallon Bucket from the Shop. 3. Open Ziplock into the bucket and fold opening down over the sides of the bucket, like a liner. 4. 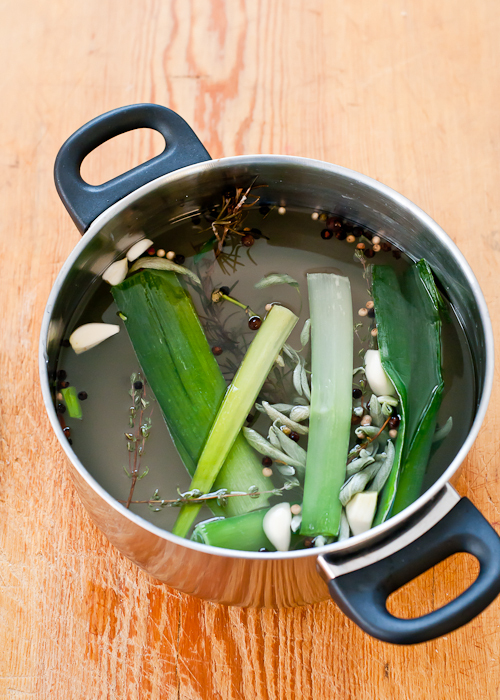 Put in a bunch of yummy extras and pour in brine. 6. Fold out all the air, and then zip that baby shut. 7. Pack the rest of the bucket all around the Turkey with Ice. 8. I brine for 48 hours. 9. I have a second fridge so I have an entire shelf available, however if it’s cold in your neck of the woods you can leave your brined turkey outside, Or keep your turkey in a very large Igloo Cooler and check the Ice. I have to agree completely with your turning of the turkey. Years ago my mom asked my sister to put the prepared turkey in the oven. She had no idea what she was doing and made a very happy mistake of putting it in breast side down. It made the best white meat ever! The juicy-ness from the dark meat drains into the breast and it is amazing! WOW!!!!!! Best turkey tutorial ever. I can almost smell it cooking now;) How long to brine for? Overnight? i am going to try this……I bet its awesome! 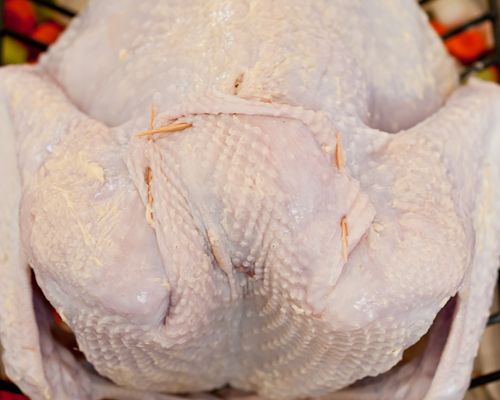 Forgive me – my turkey anatomy is a bit rusty – where exactly is the thigh where the temperature be taken? While your photo is lovely I cannot tell exactly where to place the thermometer. We usually cook the turkey on a charcoal grill. Super yummy and frees up my teeny-tiny German oven for other things! great tips here. i’ve used all of those in the past and have worked wonderfully for me. the only two things i do differently is 1) separate the skin from the turkey (breast and legs) and put butter under the skin 2) cover the breast and turkey in bacon strips for the first hour with aluminum on top. Wow. I thoroughly enjoyed reading your post and seeing the beautiful pictures. I’d love for my Thanksgiving turkey to turn out like that!! That looks amazing! Thanks for the tips. We’ve had success at my house using those big buckets that wheat or rice come in for brining the turkey. This is perfect! I have the brine going right now. My turkey is going to be too big to turn. When should I tent the breast with foil? From the beginning? Half way? After it is brown? Up to about 16-18 lbs. Well, you could turn a larger one, but they are heavy! Tent the breast with foil when it’s breast-side up. I start from the very beginning. Take it off at the very end if you want the skin extra crispy. Picture perfect and tasty, too! Thanks for your help! Gabrielle, I simply love your step by step!! Amazing photos, all the tips, I really want to share your post on my blog if you allow me. Here in Brazil we eat turkey at Christmas and fresh fruits as a side dish. Well, let me know, ok? Thank you for sharing! Will definitely be trying this next year. Thank you for this post! I made my turkey following your instructions with the brine and it was the best Turkey I have ever made. Our family will be using this every year from here on out. I made this turkey today and it turned out great! My mom and I used this recipe for thanksgiving this year. We had never even heard about brining a turkey until we read the recipe. We followed the recipe right through and our turkey was such a hit! It was so moist and juicy and flavorful and to our surprise, not salty! We used a 5 gallon lemonade container to brine it in, which was kind of genius because we had to carry it up and down a few flights of stairs. When it was done brining in the morning we just used the dispenser button and drained most of the brine before carrying it back upstairs so it was lighter for us. We had a 25 pound turkey so the only thing that we didn’t do was roast it breast side down because we didn’t know how we were going to flip it. This turkey belonged in a restaurant! The family was so impressed. Thank you for your recipe we will be using it from here on out! Doesn’t brining make the turkey salty? Instead of using the oven can you use just a regular roaster for this recipe? I prefer to dry brine my turkey.It is so much less effort. Rinse, rub with kosher salt,place in a bag.Put in fridge for 3 or 4 days turning each day.Then roast as above. Best turkeys I have ever roasted.Happy Thanksgving. I do this also. It’s so much easier to dry brine. Will never wet brine my turkey again! It’s too much of a hassle. I never ever basted my turkey. It dries out the meat. I used to do it for years and just once tried it without and it was so much more moist. Stuffing bacon under the skin is fantastic too! Cool guide BTW. Thank you for posting this. I am roasting a turkey for the first time and this has been an immense help! I can’t wait for it to finish. Does it have to be unsalted or salted butter? Does it need to be melted as well? Convection, bake convection or regular roast or regular bake? Decisions decisions. At what point do you turn it over? Half way thru? I live and work in Europe and this is the first time I have hosted a Thanksgiving Dinner for friends. Your tips made my dinner an absolute success. I have never had a turkey SO moist and tasty thanks to the brining and oven tips. THANK YOU! The extra work was well worth the effort. 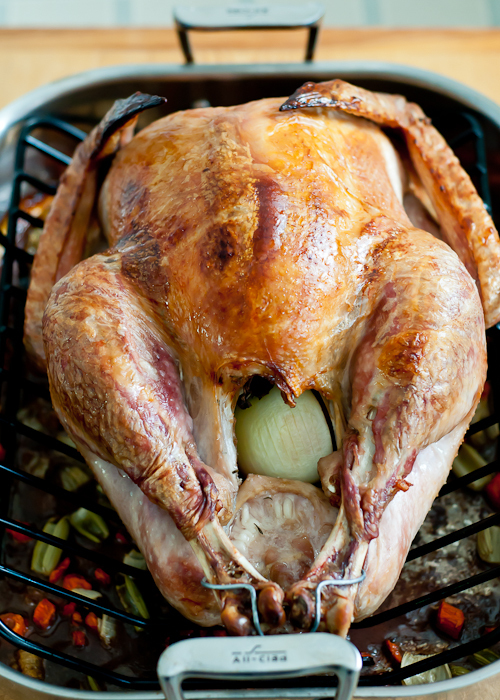 If anyone is interested in cooking the perfect turkey – these 7 secrets are a must. Hosting Thanksgiving? Here Are Your Planning Checklists! My secret to the juicy turkey is the marinade of wheat beer, soy sauce, orange juice. I found the tip in this video and the turkey really turns out tender and tasty!